The lovely home has been completely renovated with style and function in mind. Fully insulated, heat and air conditioning, complete home away from home. The two bedrooms are comfortable and roomy with views to the Causeway. Kitchen and living room are open concept, fully furnished and applianced, with breathtaking lake views. Bath with shower, washer and dryer, and large deck with grill complete the home. The backyard has a fire pit for quiet, relaxing evenings. The clean, sandy, private beach is just steps away, with no hills or stairs to navigate. There is also a mixer and a blender, hair dryer, iron and ironing board. As described, it’s a beautifully-renovated house. Gorgeous wood floors! Lovely views, front and back. Washer and dryer, sorely needed after hiking to the summit of Mt. Mansfield. A wonderful place to relax and enjoy vacation! My family of four stayed here in October for the long weekend, and we had a great time. The place is cozy but spacious in the right places, particularly the living room and kitchen. It was too cold for us to enjoy the lake, but the heaters kept us nice and warm when we got home from enjoying Burlington, Shelburne farms, and the bike trails. This was a very well-appointed, very clean cottage with everything a family would need to have a comfortable stay. Beautiful views out to the lake, (including sunsets!) very close proximity to the Burlington Bike path and the causeway, and only about 10-15 minutes to downtown Burlington. We really felt at home and enjoyed taking our dog for walks around the neighborhood meeting other dogs and their human parents. The hosts were very accommodating and let us borrow tools from their shed when our bike rack broke en route. One of our favorite rentals. I would highly recommend! 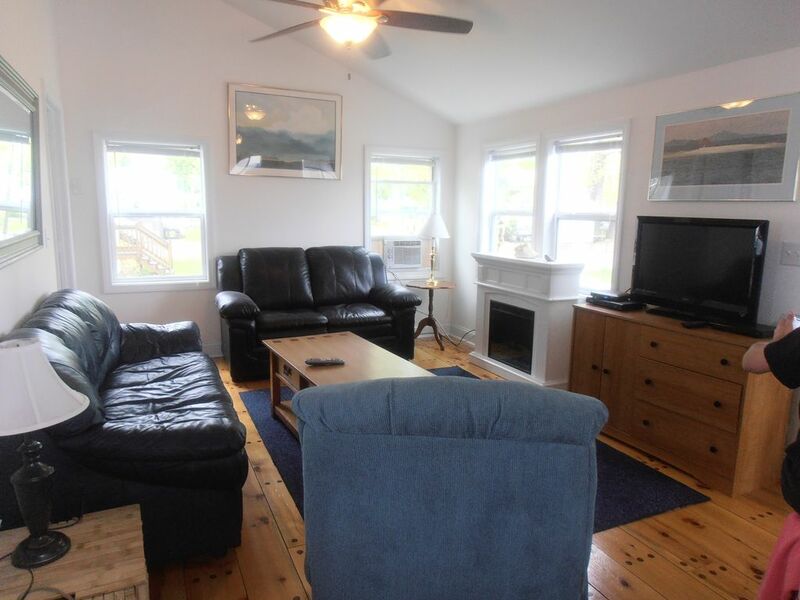 The cottage- a clutter free open concept, with vaulted ceilings, two bedrooms and plenty of places to sit, eat, etc. The kitchen was pretty well stocked with dishes, pots, pans, silverware, etc. Laundry room in the bathroom was convenient. Cable and internet worked without a hitch all weekend. The sandy beach (which you can see from several areas in the front of the house) was beautiful! Amazing sunsets! The causeway and marsh land can be viewed out the rear of the house. So pretty! Fire pit, grill, and seating available in the back yard. The deck on the side yard was nice to have. Overall, we (party of 2) had a nice time being tucked away outside of busy Burlington. We drove in for shopping and some dining out multiple times. 15-20 min drive. Leaf peeping in the hills outside of Burlington was spectacular. Highly recommend this place. Would consider staying again with my two little ones. Colchester is loaded with great outdoor recreational activity choices. The bike path meanders along the lake into Burlington, the Causeway cuts directly across the lake into South Hero. There is a multi-recreational park 1 mile from the camp that has tennis courts, basketball courts, volleyball, horseshoes, soccer fields, running track, 4 baseball fields and a playground for young children. There is a boat launch less than a mile from camp and a marina about 3 miles away. Colchester Point also boasts one of the few sandy beaches in the area.